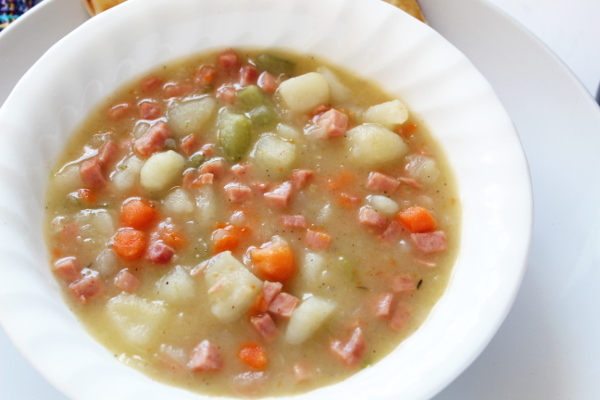 Bean soup is filling, easy to make and economical. 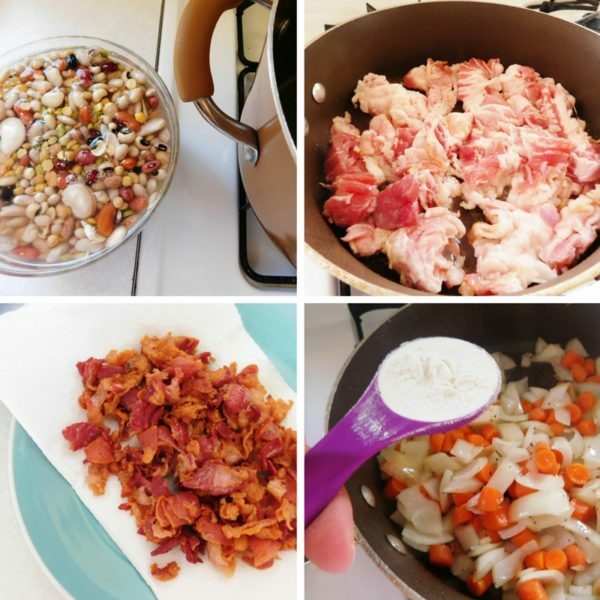 This recipe for Thirteen Bean and Bacon Soup is full of vegetables, beans, and bacon. Top with green onions and you’ve got a great meal to get you through the colder weather. Well, we missed the snow! Last Saturday we hightailed it out of here when it just started sleeting and missed the light dusting that came soon after. Where did we head to you might ask? Oh, a little place called ‘Disney’! While Michigan had it’s first cold spell we were basking in the sun, swimming & riding roller coasters. It was a great trip but now it’s time to settle into the reality that Winter is coming. 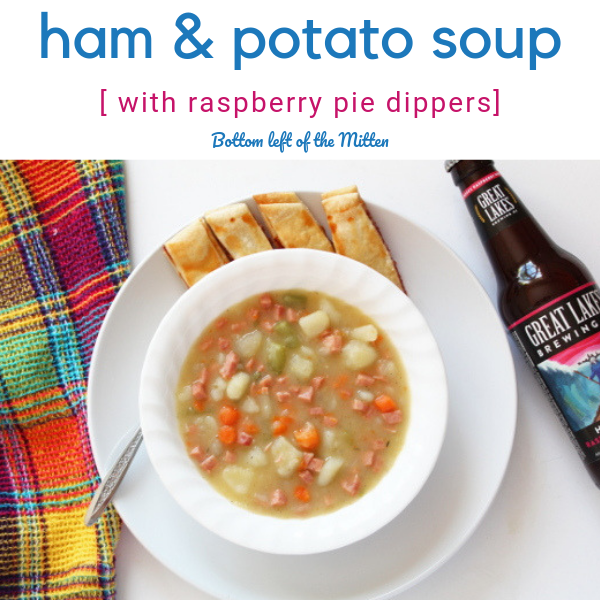 I’m okay with that–because I get to celebrate Mitten Movie Night snuggled up while the wind howls drinking some craft beer and enjoying a warm bowl of soup. 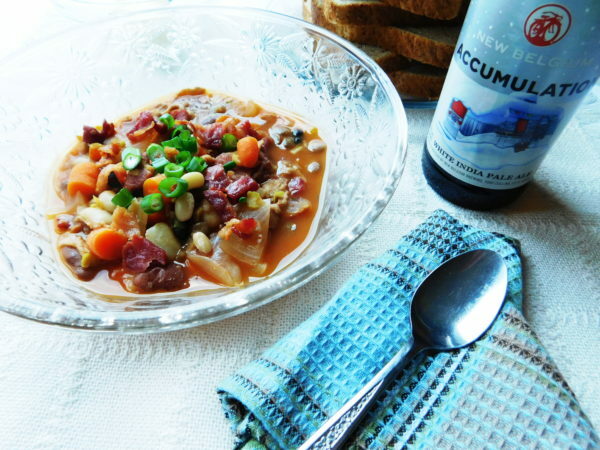 What movie pairs well with bean and bacon soup and beer? For the movie, we’re watching Elf. Will Ferrell is my favorite actor. As I mentioned before I really think he’s one of Hollywood’s hottest. I also need to watch a holiday movie because after spending Thanksgiving week in Florida I’ll be honest, I kind of forgot that it even IS the holidays. When we got to the hotel in Disney they were playing Christmas songs and it was decorated but something just felt ‘off’ about it. Don’t get me wrong, Disney World does a fantastic job, but they do not have the two things that make the season for a Michigander and that’s bone-chilling cold and the possibility of a White Christmas. It may seem like I’m a State snob but I’m not Michigan has ‘Winter Wonderland’ in spades and we do it better than most. Time to reset my mind now that we’re home. 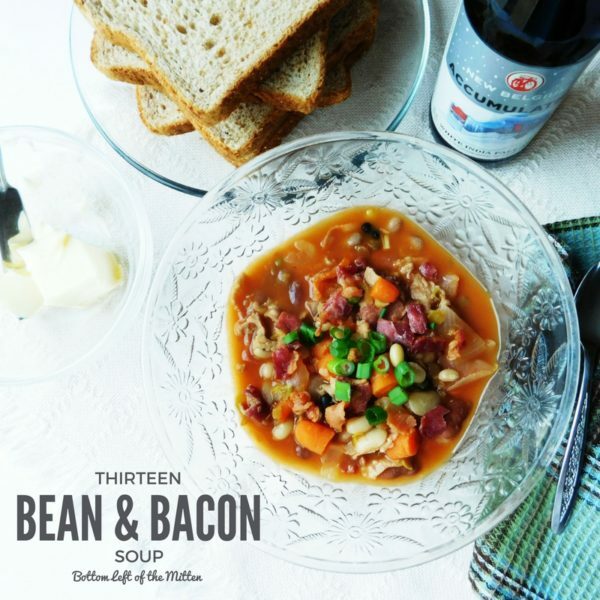 What beer pairs well with Thirteen Thirteen Bean & Bacon Soup? The beer: Accumulation from New Belgium. 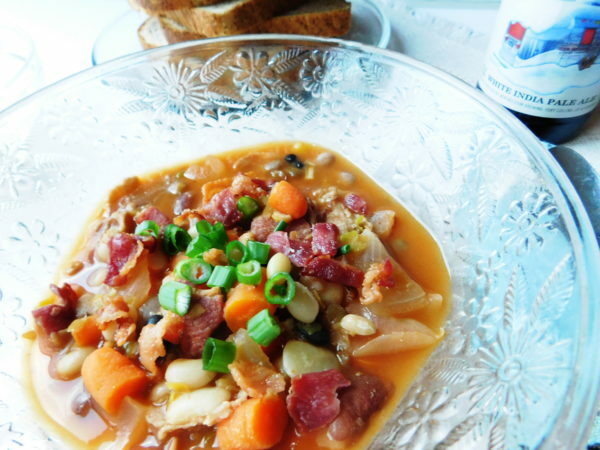 A White IPA perfectly pairs with the beefy bacon and tang of the tomato base in this bean and bacon soup. The tomato comes from a favorite of mine, condensed soup. This time of year I can get such a great deal on them so I stock up. Adding it to recipes like my Cream of Chicken Bake or just for heating up to dip grilled cheese in. This Thirteen Bean mix came from Fresh Thyme Market in Mishawaka, IN. We’ve been to this store a few times but just decided to peruse the loose bins section. The convenience of filling the bags with just the amount I needed and the ‘required’ gummy worms that Little A was unable to leave the store without was great. Starting off soak your beans for 6-8 hours in cold water. Drain the water and rinse them when it’s time to cook the soup. Add 5 cups of chicken stock to a large stockpot with the beans then set to medium heat. Now dice the bacon and cook to the preferred doneness. While the bacon is cooking chop the onions, garlic, and carrots. When bacon has cooked remove and put on a plate with a paper towel. Reserve 1 Tbs of the bacon grease. Add onions, garlic, and carrots to the pan with the bacon grease and saute for 5 minutes. Let the veggies slightly softened. To the vegetables stir in 1 Tbs flour which will eventually add a little thickness to the soup. Into the pot of beans and chicken stock add the cooked bacon, all the vegetables then finally the can of condensed tomato soup. Set to low/medium heat then cover and let it do its thing for around 1-1/2 hours. 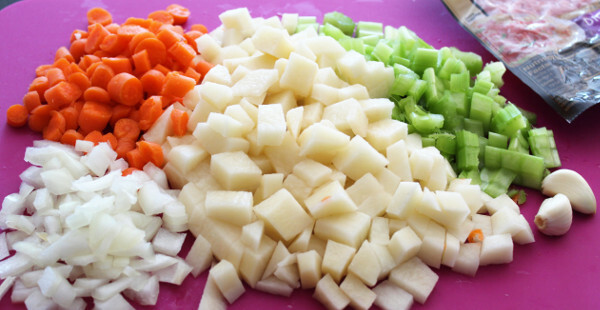 Chop up some green onion for the top. If you can’t find a bean combination great northern bean would work as well. For an even fuller meal, add some cooked ground beef. 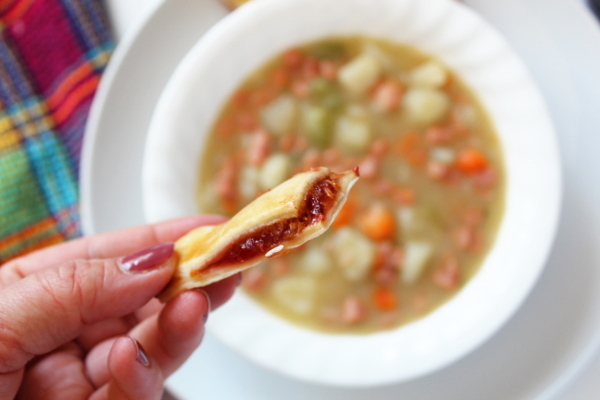 Who knew that making a delicious soup could be so simple and taste as good as the canned original? 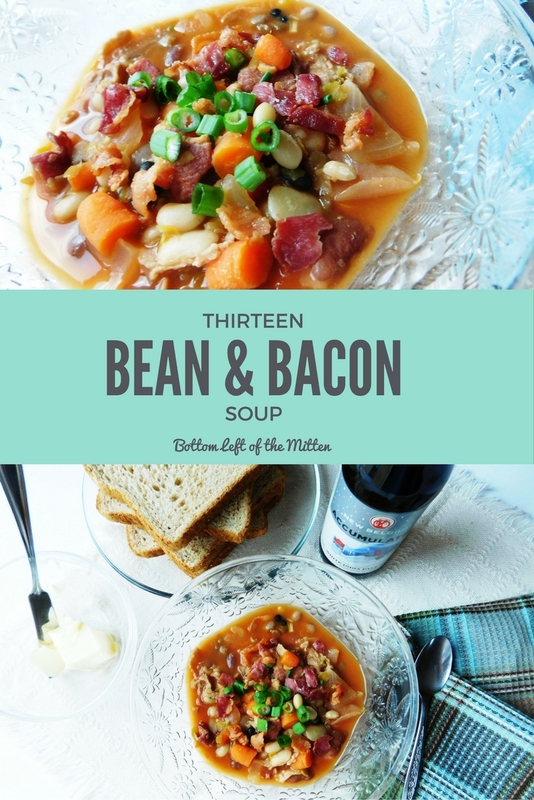 Thirteen Bean and Bacon Soup makes a cozy winter meal. Soak beans for 6-8 hours in cold water. Drain the water and rinse them. Add 5 cups of chicken stock to a covered pot with the beans then set to medium heat. Dice and cook bacon to desired doneness. Chop the onions, garlic, and carrots. When bacon has cooked remove the bacon and put on a plate with a paper towel reserving 1 Tbs of the bacon grease. Add onions, garlic, and carrots to the pan with the bacon grease and saute for 5 minutes until the veggies have slightly softened. To the vegetables stir in 1 Tbs flour which will eventually add a little thickness to the soup. To the pot of beans and chicken stock add the cooked bacon, all the vegetables then finally the can of condensed tomato soup. Set to low/medium heat and let it do its thing for around 1-1/2 hours. Place in a serving bowl and add chopped green onions if desired. Enjoy! Summer certainly went by quickly. Now that school is back into swing and football practice two nights a week I really need to make sure that I can get dinner on the table without much fuss. This Salsa Chicken Skillet it perfect! This is something that I’ve been making for years. It’s really quick, just a few ingredients and all cooked in one pan. 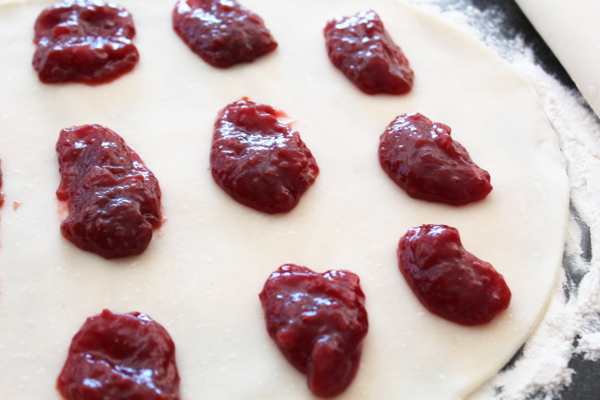 So gather your ingredients…. Add the oil to the pan then add chicken and the onion. Saute until chicken is cooked through. I like to set up the rest of my ingredients next to my pan. Once chicken is cooked pour the flour over the top then add the chicken stock and ranch dressing. 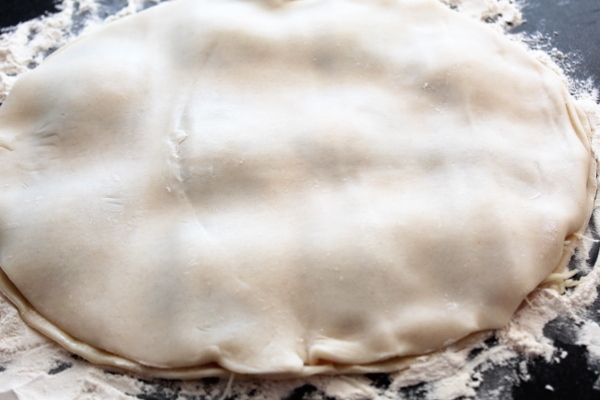 While it’s coming to a boil cut up your tortillas like a pie. Once it’s to a boil add your tortillas to the top of the skillet and stir to combine. Cook for around 3-5 minutes. On top of the chicken & tortillas pour the entire jar of salsa on top. Don’t stir. Place cheese on top. Cook until cheese it melted. Serve with some lettuce and sour cream. 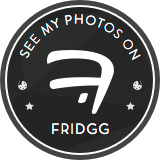 And here you are…. A spicy addition to your busy dinner routine. Add the oil to the pan then add chicken and the onion. Saute until chicken is cooked through. Once chicken is cooked pour the flour over the top then add the chicken stock and ranch dressing. While it's coming to a boil cut up your tortillas like a pie. Once it's to a boil add your tortillas to the top of the skillet and stir to combine. Cook for around 3-5 minutes. On top of the chicken & tortillas pour the entire jar of salsa on top. Don't stir. Place cheese on top. Cook until cheese it melted. Serve with some lettuce and sour cream.